Metro Call-A-Ride paratransit service is for passengers who rely on transit to get them where they need to go, even if it's outside the MetroBus and MetroLink network. Metro Call-A-Ride service is available, with advance reservations, to both the general public and to persons whose disabilities prevent them from using the accessible, fixed-route transit services (MetroLink and MetroBus). You’ll share your ride with other passengers in modern, wheelchair-accessible vehicles. Priority reservation scheduling is provided to customers with disabilities who qualify for Americans with Disabilities Act (ADA) paratransit services. Please note that while the Metro Call-A-Ride service is a great benefit to passengers who cannot use MetroBus and MetroLink, it is not a direct service. You will be sharing the service with other passengers. We encourage all passengers to explore all of the available Metro transit options that may provide a quicker or more direct journey. To determine the type of service available to you, please consult the service-boundary map below or take a look at our Guide to Accessibility and Independence for more information. 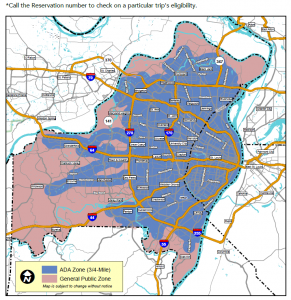 If you’re eligible for service through the Americans with Disabilities Act (ADA) and you’re taking an ADA-mandated trip in the blue-shaded areas, Metro Call-A-Ride service is available to you seven days a week. To qualify for an ADA trip, the trip must start and end within 3/4 of a mile of fixed-route services at the time they are operating. If there is no fixed route-service in the 3/4 mile area or at the hours of MetroBus or MetroLink service, then ADA Paratransit Services are not available. If you’re not ADA-eligible or you’re not taking an ADA-mandated trip, you can still use Metro Call-A-Ride to travel within the blue shaded area, but you’ll be charged non-ADA rates. Non-ADA service is available to everyone in the pink-shaded area seven days a week, and in the blue shaded area on Saturday and Sunday only. Non-ADA fares will apply for these trips. For more information on fares, call Metro Call-A-Ride at 314-982-1505. To find out if you’re eligible for ADA Service, please call the Metro ADA Office at 314-982-1510 (TDD 314-982-1509) or visit our ADA Services page. For Metro Call-A-Ride reservations, call 314-652-3617 or toll free at 888-652-3617. For the hearing impaired, call Relay Missouri at 711. NOTE: The ADA permits flexibility in scheduling to allow Metro Call-A-Ride to accommodate as many customers as possible. Your trip may be scheduled up to one hour before or after the pick-up time you requested. Once your trip is scheduled, we may pick you up 15 minutes before or after your scheduled pick up time. You must be ready 15 minutes before your scheduled pick up time. Please note that non-ADA-mandated trips can only be reserved up to one day before the trip. All trips can be booked on the day of travel, if space is available. ADA-mandated trips that are frequent and ongoing may be eligible for a pre-booking status. To cancel a Metro Call-A-Ride trip, call 314-289-5230 at any time. Cancel early if you are unable to keep your reservation so we can adjust our schedules and make room for other customers. Please call as early as possible, however you must call at least three hours before your scheduled ride or you will receive a no-show infraction. Repeated late cancellations or no-shows may result in a suspension of your riding privileges. For additional information, please contact our Customer Service Coordinator at 314-982-1505. Questions? Call the Customer Service Coordinator at 314-982-1505 or check out our Accessibility Guide.